The environment where an organism died. The materials that made up the organism's body when it was alive. The rapid burial of remains beneath a blanket of sediment is critical to the process of fossilization because burial separates the remains from the biological and physical processes that would otherwise destroy them. Paleontologists use the term taphonomy (from the Greek taphos—meaning burial or grave—and nomos—meaning rules or law) to describe all the events that happen to the remains of an organism between the time that it dies and the time that it is buried. Many events can impact remains between these two events. For example, the remains may be scavenged, broken, or transported long distances before being buried. Geologists characterize habitats where burial occurs as depositional environments. Depositional environments are almost always basins, or depressions on the Earth’s surface. Basins can range from very small (like a pothole in a road) to medium sized (like a lake) to global scales (like the Pacific Ocean Basin). Because of gravity, water flows downhill until it reaches a basin that it cannot move past; think of a river flowing downhill from a mountain that fills a lake below. Fast moving water may have enough energy to transport large amounts of sediment, including grains of mud, silt, sand, and pebbles. When the fast moving water collides with the slow moving water in a basin, the available energy decreases dramatically and the sediment can no longer be carried by the water and it is knocked out of suspension. This causes the sediment to be deposited in layers, with younger layers of sediment covering the older layers below (this is the Principle of Superposition). The remains of organisms are typically only fossilized in depositional environments where sedimentation—and therefore burial—is frequent. Examples of common depositional environments are lakes, river deltas, and ocean basins. Organisms that live in these types of environments—or are transported to these types of environments soon after death—are much more likely to be preserved as fossils than organisms that live elsewhere. In general, organisms that live in or near depositional environments have much better fossil records than organisms that live far from such habitats. 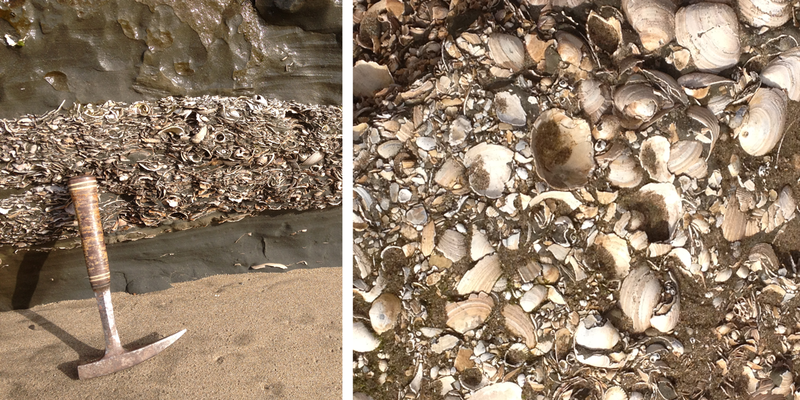 For example, consider the fossil-rich layers of marine shells shown in the photograph below. 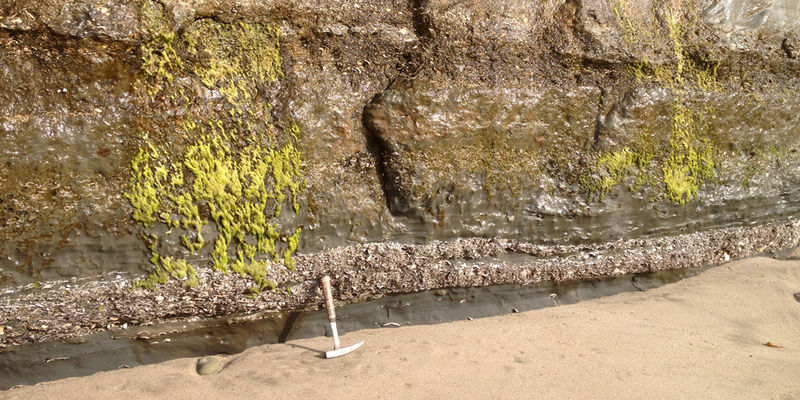 An exposure of the Purisima Formation (Neogene Period) at Capitola Beach, near Santa Cruz, California. The handle of the hammer rests upon a particularly rich fossil layer (see below). Photograph by Jonathan R. Hendricks. This work is licensed under a Creative Commons Attribution-ShareAlike 4.0 International License. Left: Closer view of the image above. Right: Examples of the kinds of fossilized bivalves found in the dense shell layer. Photograph by Jonathan R. Hendricks. This work is licensed under a Creative Commons Attribution-ShareAlike 4.0 International License. Why are most of the shells restricted to individual, densely packed layers? Are the shells in life position, or were they transported to this location prior to burial? Did shells found next to each other live at the same time? Answering these questions depends upon interpreting the fossils in their context in the field and recognizing the roles that taphonomy plays in generating the fossil record that we observe in nature. In the case of this example, many of the shells were likely swept up from the seafloor by large waves during a rare, massive storm event and then dropped into this single, densely packed layer. This interpretation is supported by other lines of evidence. First, the fossil assemblage includes exclusively remains of marine organisms. Second, the shells are all mixed together and do not appear to be in life position (we know this by comparing their shell orientations in the rock with the resting positions of their live relatives). Finally, we do not have enough information available to say for sure whether or not two shells found next to each other were contemporaneous, though it may be unlikely: the robust shells of some mollusks may spend many years in habitats--long after their owners died--before they are finally buried. This final process is referred to by paleontologists as "time averaging." Because many fossil deposits contain multiple generations of organisms, it is useful to view such assemblages--borrowing some terminology from photography--as time exposures rather than snapshots. Because mollusks like the ones shown above often live their lives in depositional environments favorable to burial, they have an excellent fossil record (this is also, of course, favored by their mineralized shells; see below). On the other hand, the fossil record of dinosaurs is--by any measure--comparatively poor. Even though dinosaurs often had robust, mineralized bones, they frequently did not live in habitats suitable for rapid burial. Indeed, many dinosaur species are only known from incomplete skeletons, sometimes only consisting of a few discovered bones. An excellent example of this is provided by the recent discovery in Argentina of massive bones that belonged to a dinosaur recently described as Patagotitan mayorum. This species of Titanosaur was one of the largest dinosaurs that ever lived and details about this “megadino” and its discovery are outlined on the website of the Museo Paleontológico Egidio Feruglio (MEF) in Trelew, Argentina. The approximate size of Patagotitan mayorum compared to two humans. Image by Steveoc 86 - Own work, CC BY-SA 4.0, https://commons.wikimedia.org/w/index.php?curid=61638555. The skeletons of seven different Titanosaurs have been found at the dig site, but all are incomplete. What happened to the rest of the bones? Taphonomy provides the answer. While the official scientific report for this discovery has not yet been published, it seems that—perhaps due to a combination of physical and biological factors—only a subset of the bones reached a suitable depositional environment. Burying large bones—including in this case single leg bones that are longer than a full-grown man—requires a lot of sediment and such extreme burial events are very rare in most habitats. Imagine that you had the job of burying a dinosaur that was more than 130 feet long – it would take a lot of sand (and a lot of hard work)! On the other hand, burying a small shell in the sand would take almost no work at all. 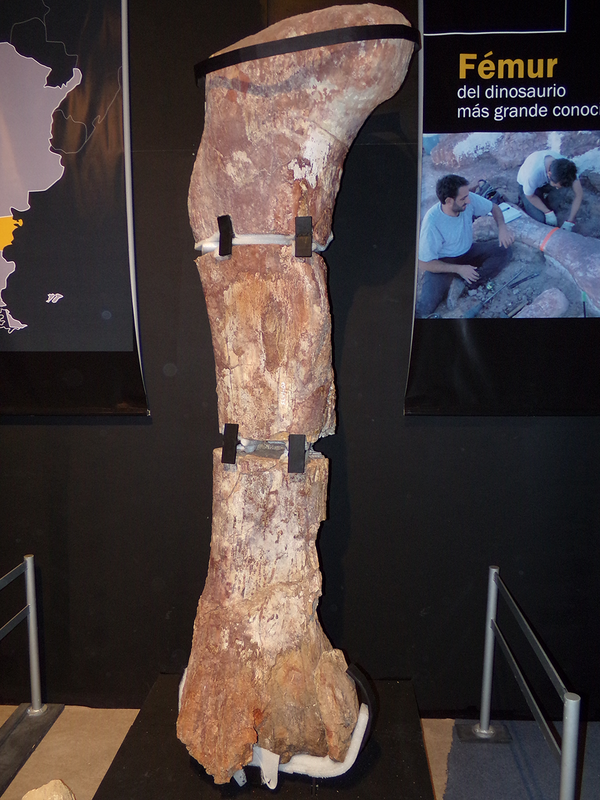 The massive femur of Patagotitan mayorum (compare with inset photograph of two individuals collecting this bone). Image by Gastón Cuello - Own work, CC BY-SA 4.0, https://commons.wikimedia.org/w/index.php?curid=41267726. The bodies of most (but not all) organisms are made from a variety of different types of tissues. These range from soft tissues like those that make up skin and internal organs to hardened materials like bones and shells that provide an animal with either internal (skeleton) or external (shell) support. Hardened tissues—often referred to informally as “hard parts”—are frequently mineralized, meaning that they are composed of a particular kind of mineral. For example, many snails and clams make their shells out of the minerals calcite and aragonite. Likewise, the bones in your body are mostly comprised of the mineral calcium phosphate. Hard parts are not always mineralized, however. Consider wood, for example, which is not mineralized when a tree is alive, but may later become petrified (turned to stone) during the fossilization process. The fossil halls of natural history museums are primarily made up of displays of bones and shells, reflecting the fact that the fossil record is comprised mostly of the mineralized hard parts of organisms. The minerals that make up bones and shells and other hard parts are usually highly resistant to biological decay and physical weathering: they break down at a much slower rate than soft tissues, which often provide food and nutrients to predators, scavengers, and decomposers. Because they are already made of geologically resistant minerals, hard parts have a much higher likelihood of making it to the burial stage of the fossilization process. Once buried, these mineralized structures have a very good chance of becoming fossilized, at least relative to soft parts. Because of this, the fossil record is biased in favor of documenting organisms with hard parts. 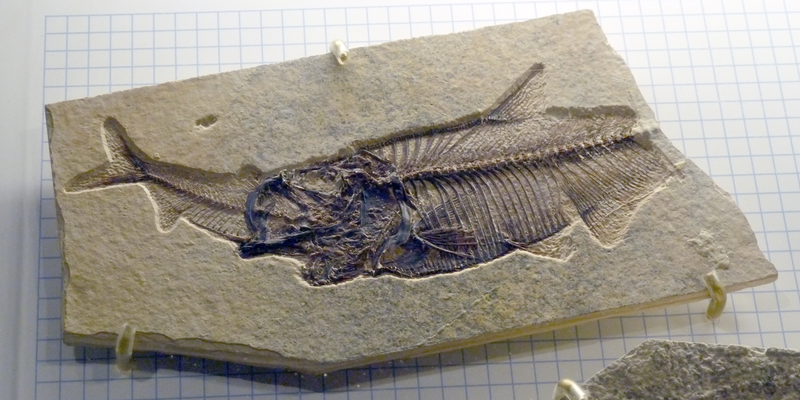 This specimen--from the Eocene Green River Formation--shows the fossilized skeleton of a larger fish (right) that apparently died while eating a smaller fish (left). Despite the exquisite preservation of fine skeletal features, no soft parts are preserved. Specimen on exhibit at Fossil Butte National Monument, Wyoming. Photograph by Jonathan R. Hendricks. This work is licensed under a Creative Commons Attribution-ShareAlike 4.0 International License. The majority of species alive today have no hard parts, however, and this was almost certainly the case in the past as well. For example, insects are the most biodiverse group of animals alive today (i.e., they are the group with the most species), but since they do not have hard parts, their fossil record is poor relative to groups like snails and clams that have shells. 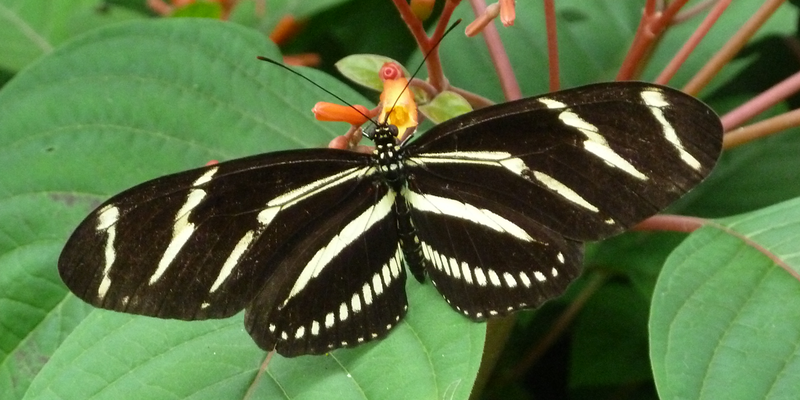 The bodies of insects like this butterfly--along with those of many other kinds of animals--lack mineralized hard parts, resulting in a comparatively poor fossil record. Photograph by Jonathan R. Hendricks. This work is licensed under a Creative Commons Attribution-ShareAlike 4.0 International License. This is not to say, however, that soft parts are never preserved as fossils. In rare circumstances, soft parts are preserved and fossil collecting localities with this type of preservation (termed lagerstätten, a German word meaning “storage place”) are of great interest to paleontologists. This is because they provide important windows on ancient biodiversity and the body forms of ancient species (beyond the typically preserved hard parts). The most famous lagerstätte is the Burgess Shale of British Columbia, Canada, which shines a light on weird-looking species from the beginning of animal life; an excellent overview of this deposit was developed by the Royal Ontario Museum. Similarly aged fossils from Utah may be viewed on the Utah’s Cambrian Life webpage. A listing of important lagerstätten from other regions and time intervals can be found on Wikipedia. 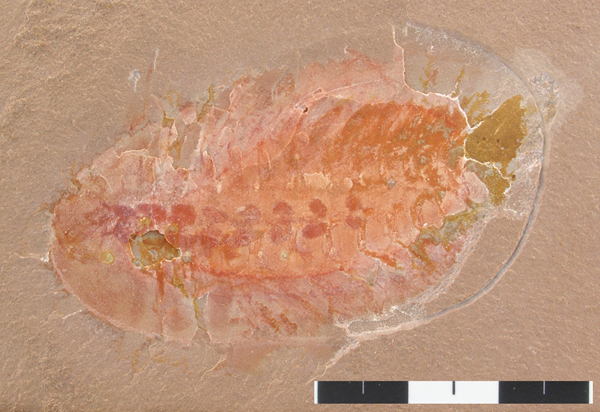 A specimen of the soft-bodied arthropod Emeraldella from the Cambrian Marjum Formation of Utah (KUMIP 204791). The red spots along the middle of the specimen are organs. Image from the Utah's Cambrian Life Webpage. Why are soft parts sometimes preserved in such lagerstätten? The answer is difficult because the circumstances and styles of preservation of soft parts vary from place to place, but a key factor seems to be very rapid burial in sediments with very little oxygen present; such environments are referred to as anoxic (meaning “without oxygen”). The low amount of oxygen is important because it slows the decomposition of soft parts by bacteria, favoring the preservation of the soft parts as thin carbon films or allowing the soft parts to be replaced with geologically stable minerals like pyrite.